One of the great attractions of Barcelona is undoubtedly Antoni Gaudí and his architecture. Everyone visiting the city does not leave (or should not leave) without having visited at least the Sagrada Familia and La Pedrera. But beyond the emblematic buildings, in Barcelona there is a museum that deepens in the figure of the Catalan architect and his work, the Gaudí Exhibition Center. Near the cathedral of Barcelona, on the avenue of the Cathedral, we find the Gaudí Exhibition Center. In this museum there is a collection of unique pieces and objects created by the most international Catalan architect, as well as documents that tell us about his life and his work. For more than a century, research has been carried out around Antoni Gaudí around the world to understand the genius of his work. The studies speak of its revolutionary method of work, and this museum in Barcelona shows the results of years of research related to the extraordinary pieces of the architect. The museum's objective of the Gaudí Exhibition Center is to value Gaudí's work and make it known. Although the most emblematic works of the architect are the great buildings such as the Sagrada Familia, the Casa Batlló or the Casa Milà, Gaudí also designed furniture and craftsmanship. All his legacy is exposed to the museum, where visitors will learn the revolutionary ideas of the artist and the unconventional methods that made him a genius. The Gaudí Exhibition Center is located in a privileged place in Barcelona, just next to the Cathedral, one of the most visited places for tourists. The building was the seat of a charitable institution called Pia Almoina, which hosted the poor and the pilgrims. Initially, in the 12th century, this institution was located in the cloister of the cathedral of Barcelona and was there until the fifteenth century. But in 1423 the building was built that is currently on top of a part of the Roman walls of Barcelona. The building, which has undergone renovations and constructions over the years, has a Gothic and a Renaissance part, and you can still see fragments of other eras such as a tower of the wall of the 4th century or a capital pre-Romanesque. The long history of the building is another reason to visit the Gaudí Exhibition Center, as all kinds of events have survived to this day, which has become the site of the most complete museum on Antoni Gaudí. And if you haven’t enough with visiting Gaudí's work in this museum in Barcelona, you can visit its iconic buildings with our e-bike tour that tracks the works of the Catalan architect that you can not miss. Casa Vicens, located in Vila de Gràcia, was commissioned to the catalan architect Antoni Gaudí in 1883 as a summer residence. The construction was finished in 1885 becoming the first masterpiece of the architect and giving the kick-off to Modernisme movement in Catalonia. The house consists of different interesting spaces, such as the garden, the basement, the main floor, the first and the second floor (where the permanent exhibition is located) and the accessible rooftop, all of them visitable. In 1925 an extension of Casa Vicens was carried out to accommodate the cultural and museological function that it currently has, and in 2005 it was declared a World Heritage Site by UNESCO. Going through the enclosure, we make a first stop in the garden of Casa Vicens. It is a space inspired by Mediterranean flora and fauna, which is why we can find plants such as palms, magnolias and roses. As a curiosity, every May 22, following a typical tradition in the neighborhood of Gràcia, there is a mass in honor of Santa Rita in the garden, where there is an image of hers, and the blessing of the roses is celebrated. Continuing with the visit we can stop at the basement, where we find the specialized bookstore La Capell, which also has a library, under a catalan vault ceiling. On the ground floor, which contains the main floor, we find the dependencies for day-time use, such as the smoking room and the dining room. The smoking room is a leisure space decorated in an exuberant way in the oriental style, and in the dining room we can find the original furniture designed by Gaudí and a collection of paintings by Francesc Torrescassana. 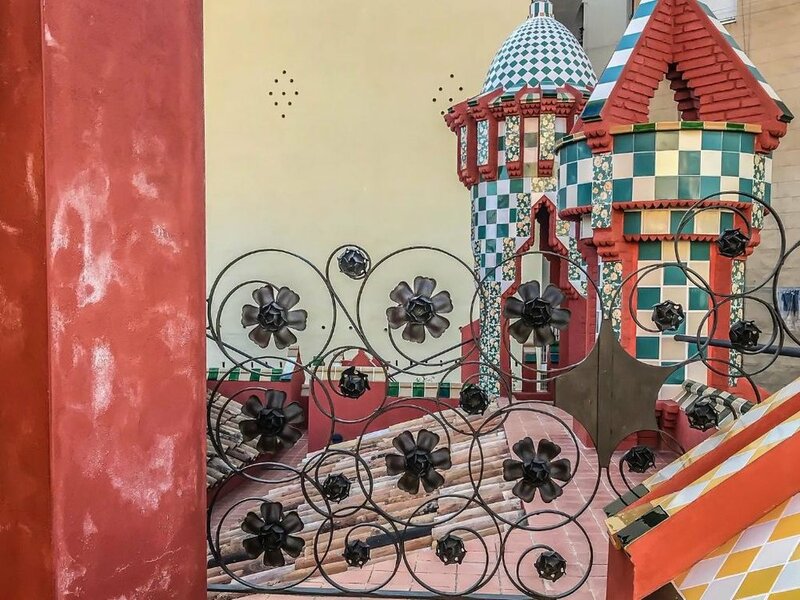 On the first floor there are the private rooms of the Vicens family (bedrooms, bathrooms...) all decorated with plant motifs and typical symbols of the Gaudí style. The second floor, where we find the permanent exhibition, is a diaphanous space with wooden beams and windows that offer a beautiful set of lights and shadows. And finally, the rooftop was built as a transitable area where you can stroll and enjoy the views. The museum project has recovered the original spaces conceived by Gaudí to publicize the essence of its architecture and decoration. Casa Vicens is now a unique cultural space of knowledge and entertainment for all audiences. Do you like to discover other emblematic buildings created by Gaudí? Pick our Gaudí & Sagrada Familia tour!